Happy Friday! Check out my post originally posted on Decmber 20, 2016. What a rough year this has been and we keep coming to these mountains and walls. They got to move! So, when we started reading Joshua and then came to Joshua 6, we got the unction to pray concerning those mountains and walls and to pray in the prescribed method the Lord gave Joshua and His people to march around Jericho. What walls do you desperately need to come down in Jesus’s name? Is it recurring debt, low self-esteem, issues on your job, issues with your children or your spouse, an issue that is recurring in the world that God has moved you to pray about, issues in your church, issues with your health? Gather scriptures concerning the matter because without God’s voice, wisdom, promise, Word on the matter, it won’t happen captain. 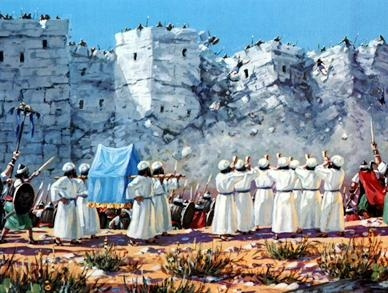 This entry was posted in Prayer, Spiritual Warfare, The Walls of Jericho. Bookmark the permalink.